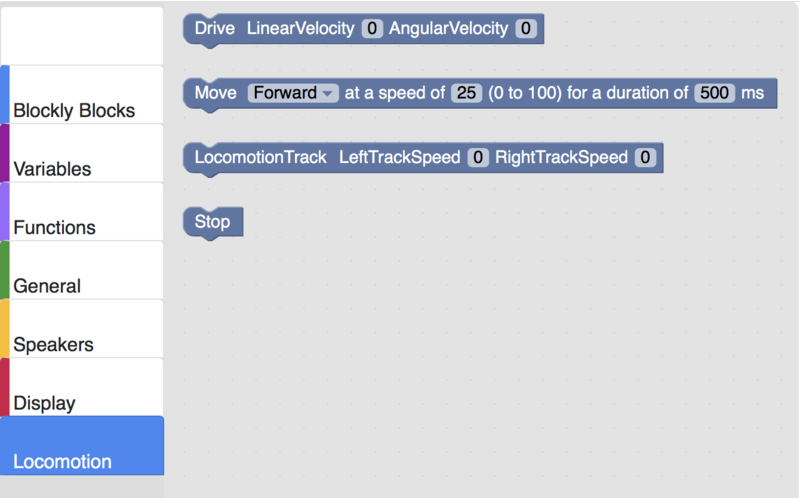 Blockly is a block-based, visual programming language editor that runs in your browser. Note: We recommend the following browsers for running Blockly with Misty: Chrome, Safari, Firefox, and Microsoft Edge (latest versions). The following controls are available on Misty&apos;s Blockly editor. Robot IP Address: Enter your Misty&apos;s IP address here; you can get this value from the Companion App. Connect/Connected button: Indicates whether Blockly can communicate with Misty. After entering Misty&apos;s IP address, click the Connect button. When Misty is connected to Blockly, the button changes to Connected. Run: Runs the blocks on the workspace. Abort: Stops the currently running Blockly project. Important! Abort stops the project after the current block completes and before the next block begins; it doesn&apos;t stop the actions of the current block. Save Project: Saves the blocks on the workspace as "blockly.txt" to your computer&apos;s Downloads folder. Load Project: Opens a saved Blockly file onto the workspace. Follow the steps below to set up Blockly with Misty. Note: It&apos;s not generally recommended for multiple users to each use a separate instance of Blockly to connect with and send commands to a single Misty robot. If more than one person does connect to Misty at the same time, as in a class or group development environment, people will need to take turns sending commands, or Misty may appear to respond unpredictably. Important! 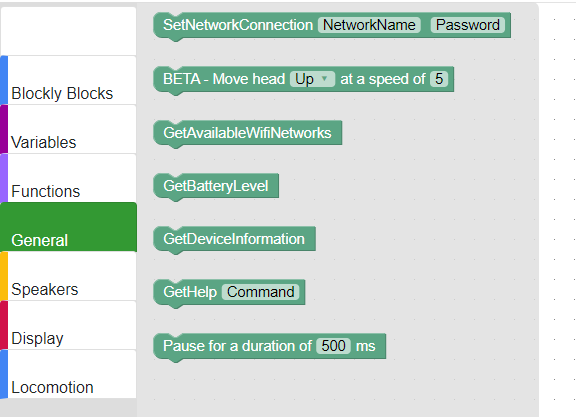 Blockly does not display the complete collection of Misty’s command blocks until after you establish a Wi-Fi connection between Blockly and your robot. If you notice missing command blocks, follow the steps below to make sure a connection exists between your robot and Blockly. Make sure Misty and your computer are on the same Wi-Fi network and that your computer has Bluetooth turned on. Open up Blockly in a browser window. 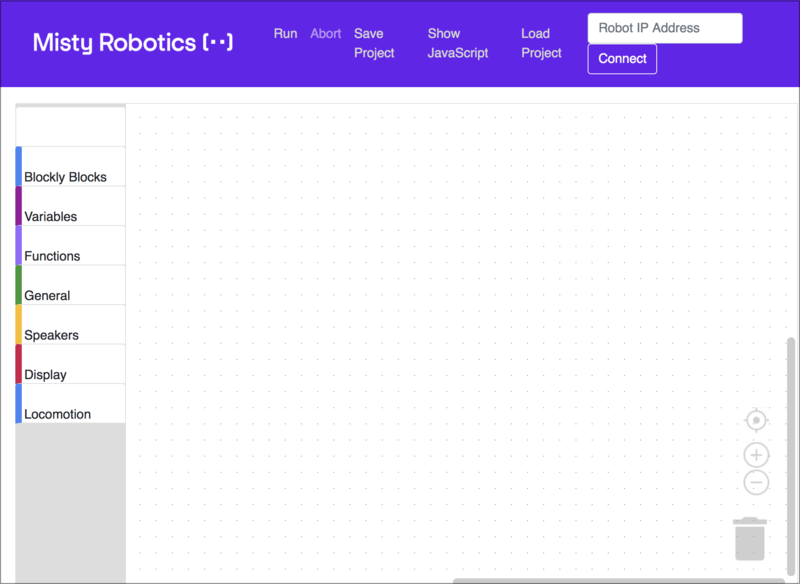 Enter the IP address of your robot in Blockly and click Connect. You can get Misty&apos;s IP address from the Info tab in the companion app. The Connect button should change to Connected. Note: If you cannot connect, double-check that Misty and your computer are on the same Wi-Fi network. If necessary, reload the page. Select a simple Misty-specific block such as "ChangeEyes" (in the "Display" category). Test that Blockly is set up by clicking Run and seeing how Misty reacts. Note: After clicking Run, there may be a short delay before Misty initially reacts. When multiple block commands are run in a row, by default there is no delay between commands. You can use the "Pause" block to add a delay between commands when running multiple commands in a row. Try the following quick "programs" to start controlling Misty with Blockly. Note: After clicking Run, there may be a short delay before Misty initially reacts. When multiple block commands are run in a row, by default there is no delay between commands. You can use the "Pause" block to add a delay between commands when running multiple commands in a row. Important! Abort stops the project after the current block completes and before the next block begins; it doesn&apos;t stop the actions of the current block. Want to change the light behind the logo on Misty&apos;s chest? Try this. Choose the "ChangeLEDColor" block and click to select a color. Are Misty&apos;s eyes looking a bit tired? Try uploading your own image to Misty&apos;s screen. It&apos;s a two-part process, but each part is very easy! Note: Misty&apos;s screen is 480 x 272 pixels in size. Because Misty does not adjust the scaling of images, for best results use an image with proportions similar to this. Add the "BrowseToImageFile" block. When you click on this block, you can select an image file on your computer to upload onto Misty. Valid image file types are .jpg, .jpeg, .gif, .png. and the maximum file size is 3 MB. Add the "ListFilesAvailable" block and select your file. Want Misty to say something new or make some noise other than her default sounds? It&apos;s another very simple, two-part process. Add the "BrowseToAudioFile" block. When you click on this block, you can browse for an audio file on your computer to upload onto Misty. All audio file types are valid, however Misty cannot currently play OGG files. The maximum file size is 3 MB. Connects Misty to a specified Wi-Fi source. NetworkName: The Wi-Fi network name (SSID). Password: The Wi-Fi network password. Displays a list of the Wi-Fi networks currently in range of Misty. Displays Misty&apos;s current battery level. 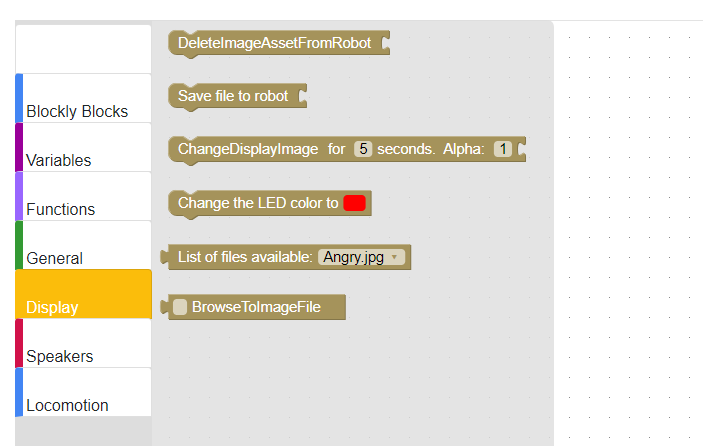 Displays hardware and version information for your Misty robot. Displays information about Misty&apos;s available commands. Calling GetHelp with no parameters returns a list of all the commands that are available. Command: Enter a specific command name or leave empty for a list of all commands. Inserts a pause between when Misty runs command blocks. Duration: A value in milliseconds (ms) for the pause. Value range: 100ms - 10,000ms, in increments of 100ms. Moves Misty&apos;s head to the left, right, up, or down. Location: Left, Right, Up, or Down. Speed: The speed at which Misty&apos;s head moves. Value range: 0 to 10. These commands direct Misty to play different sounds and allow you to upload custom sounds to Misty. Saves an audio file onto Misty. This block must connect with the "Browse for file" block, to select the audio file to be saved. File: The audio file to save to Misty from the "Browse for file" block. This command accepts all audio format types, however Misty cannot currently play OGG files. The maximum file size is 3 MB. Plays an audio file that has been previously uploaded to Misty. 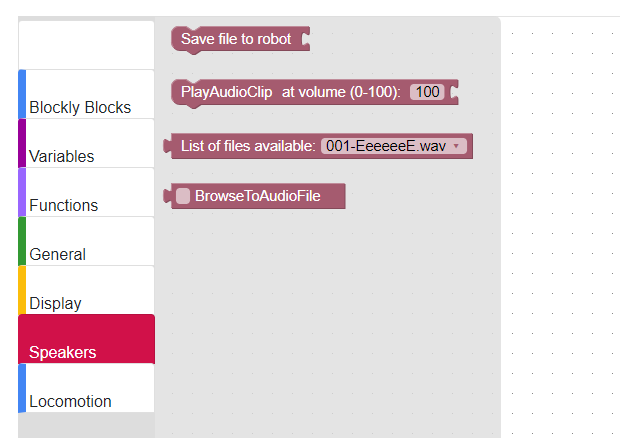 This block must connect with the "ListFilesAvailable" or "GetListOfAudioClips" block, to select the audio file to play. File: The audio file to play. Connect the "ListFilesAvailable" or "GetListOfAudioClips" block to this block in order to select an audio file. Volume: A value between 0 (silent) and 100 (full volume) that determines how loudly Misty plays the audio clip. Lists the existing audio files on Misty. Connect this block to a "PlayAudioClip" block to select a sound to play. You can also connect this block to a "DeleteAudioAssetFromRobot" block to remove an audio file you&apos;ve previously uploaded to Misty. Allows you to browse for a file on your computer. Connect this with a "SaveFileToRobot" block to select a file to upload to Misty. File: When you click on this block, a browse file dialog is displayed to allow for file selection. All audio file types are valid, however Misty cannot currently play OGG files. Maximum file size is 3 MB. Lists the existing audio files on Misty. Connect this block to a "PlayAudioClip" block to select a sound to play. Enables you to remove an audio file from Misty that you have previously uploaded. Connect this with a "ListFilesAvailable" block to select a file to remove from Misty. Note: You can only delete audio files that you have previously uploaded to Misty. Blockly posts an error if you attempt to remove one of Misty&apos;s default system audio files. The name of the audio file to remove, supplied by a connected "ListFilesAvailable" block. These commands direct Misty to display different images and allow you to upload custom images to Misty. Enables you to remove an image file from Misty that you have previously uploaded. Connect this with a "ListFilesAvailable" block to select a file to remove from Misty. Note: You can only delete image files that you have previously uploaded to Misty. Blockly posts an error if you attempt to remove one of Misty&apos;s default system image files. The name of the image file to remove, supplied by a connected "ListFilesAvailable" block. Saves an image file to Misty. This block must connect with the "BrowseToImageFile" block, to select the image file to be saved. File: The image file to save to Misty from the "BrowseToImageFile" block. Valid image file types are .jpg, .jpeg, .gif, .png. Maximum file size is 3 MB. Misty&apos;s screen is 480 x 272 pixels in size. Because Misty does not adjust the scaling of images, for best results use an image with proportions similar to this. Displays an image on Misty&apos;s screen. This block must connect with the "ListFilesAvailable" block or the "BrowseToImageFile" block, to select the image file to display. You can optionally use "ChangeDisplayImage" to display an image for a specific length of time and/or overlay an image on Misty&apos;s eyes. Filename: The name of the file containing the image to display, selected from the "BrowseToImageFile" block or the "ListFilesAvailable" block. Valid image file types are .jpg, .jpeg, .gif, .png. Maximum file size is 3MB. Seconds: Optional. The length of time to display the specified image. Alpha: Optional. A decimal value for the transparency of the image. A value of 0 is completely transparent; 1 is completely opaque. When you specify a value greater than 0 and less than 1, the image appears but is transparent, and Misty&apos;s eyes appear behind the specified image. Changes the color of the LED behind the logo on Misty&apos;s torso. Color: A color selected from the block&apos;s options. Obtains a list of the images currently stored on Misty. Connect this with a "ChangeDisplayImage" block to select a file to display on Misty&apos;s screen. Browse for a file on your computer. Connect this with a "SaveFileToRobot" block to select a file to upload to Misty. File: When you click on this block, a browse file dialog is displayed to allow for file selection. Valid image file types are .jpg, .jpeg, .gif, .png. Use these commands to drive Misty forward and backward, straight or in a curve, or stop. Note: Before using any locomotion commands, have Misty on a flat surface with plenty of room to move. It&apos;s also a good idea to experiment with small velocity values before getting her going at full speed. Drives Misty forward or backward at a given speed. Important! The "Drive" block cannot be the final block in a project. "Drive" must be followed by "Stop" or some other block. LinearVelocity: A percent value that sets the speed for Misty when she drives in a straight line. Default value range is from -100 (full speed backward) to 100 (full speed forward). AngularVelocity: A percent value that sets the speed and direction of Misty&apos;s rotation. Default value range is from -100 (full speed rotation clockwise) to 100 (full speed rotation counter-clockwise). Note: For best results when using angular velocity, first experiment with using small positive and negative values to observe the effect on Misty&apos;s movement. Drives Misty forward or backward at a given speed for a duration specified in milliseconds. Speed: A value from 0 (stopped) to 100 (full speed). Duration: A value in milliseconds, using 100 ms increments, with a maximum value of 10,000 ms (10 seconds). Drives Misty left, right, forward, or backward at a given speed. Important! The "LocomotionTrack" block cannot be the final block in a project. "LocomotionTrack" must be followed by "Stop" or some other block. LeftTrackSpeed: A value for the speed of the left track, ranging from -100 (full speed backward) to 100 (full speed forward). RightTrackSpeed: A value for the speed of the right track, ranging from -100 (full speed backward) to 100 (full speed forward).